Twenty-eighteen? Can you believe it? I know I can’t. It seems the years just seem to speed up, one faster than the last. Therefore making me older as well, which I don’t feel – ok some mornings I do. So much has happened in the last few months. My Dad was hospitalized for a couple of weeks and that gave us a scare. I was his “go to” person for which I am grateful. I was able to help explain and extrapolate some of the medical jargon along with offering up questions to answer and of course, support. Trips to and from the hospital with my mum eventually ending up with Dad being home and a plan for the new year. Now just to get the date “in the new year”. Also during this same time, someone very close to me was dealing with the annual mammogram only to be told “you need to come back for an ultrasound” which was followed by a biopsy which is followed by an eternity of waiting. Your entire life stands still will you wait for what you may not already know is coming. The diagnosis and those words……… Surgery went well and now 6 weeks of healing before radiation can be started. Hubby has been dealing with a painful shoulder which the ultrasound showed as a tear in the supraspinatus tendon. Chiropractic has been helping return his range of motion (ROM). I believe the pain is also decreasing. Christmas had my heart so full as all the kids where home. Our eldest daughter came out from Toronto til the 24th afternoon. A house full of people for Christmas dinner, the Christmas lights at Butchart Gardens including riding the Carousel with 2 of my 3 grandsons, Christmas cookie decorating with all 3 grandsons, Butterfly Garden visit and ending the year with my folks celebrating 58 years of marriage. I reflect back over 2017 and it presented challenges as all years do. Arrival of another grandson was a highlight. 2017 just seemed to pass so quickly. 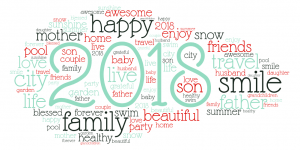 Here comes 2018 – looking forward to a year filled with more positive. I will try to be kinder and listen more. I hope to turn negatives into positives both is action and speaking. I want to pause before I retort to make the words more loving and supportive. I wish that 2018 keeps you healthy and provides loving support around you. That your heart is full more than not, that you reflect the end of each day with gratitude. Start off with 5 things you are grateful for each day (working up to 10 or more) – write them down and reflect on them come bedtime. You will sleep better with these positive words of gratitude. Remember to breathe and be grateful.